Been a while since we last had one of these. Anyone care to identify this beastie? Okay, it's a shrub, not a beastie, but you get the idea. Attribution to follow. Update: Identity available here. Photo by Josiah. Fouquieria (Idria) columnaris of the Fouquieriaceae? The Boojum Tree (from Lewis Carrol) or Cirio (Spanish = candle). If that is right then I got it from the bent top. Oleg Polunin defined a tree as a woody plant over 2 metres, a shrub being a woody plant under 2 metres. For the purposes of his Trees and Shrubs of... series, I think he knew the usual overlapping meanings. I think that counted even for living telegraph poles. I know, I just like the sound of the word "shrub". I thought it was Didieriaceae at first but look at the cactus at the bottom left, so Californian it has probably got an agent. Lovely word, shrub. You know shrub is a style of alcoholic cordial? From the same Arabic root as sherbert and syrup. 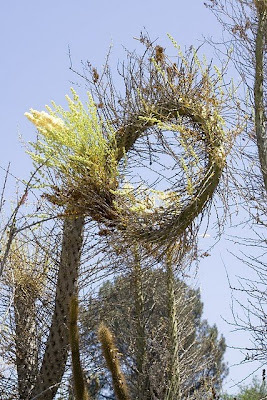 It looks like a mesquite plant that has a hoop-snake nest in it.